Hello, everyone! I hope you are enjoying the second day of Eid. 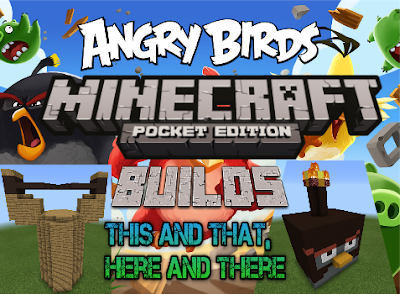 This is Arca, and according to the last Google+ poll, the two Angry Birds Minecraft PE builds you wanted me to build were the bird Bomb and a slingshot. (The piggy airplane was also tied with the slingshot, but the only vote for the airplane was made by one of my accounts, so I didn't count it.) Without further ado, here are the builds! As you can see above, most of the slingshot is made of wooden plank blocks. The base is a cylinder, and two parts are coming out of it. There is a dark-brown band around these parts, which leads to the rubber-band part that you insert a bird into to make it fly through the air. The Bomb bird is mostly black. He has red eyebrows and a grey outline around his eyes. His stomach is also grey. There is a part coming out of the top of his head, and it has a flaming part at the top, just like a cartoon bomb would be like. I hope you enjoyed. Thanks for reading this and share it with others. Happy Eid everyone! Stay tuned for tomorrow's post, and a post every day of the summer. I will see you next time. BBYYYYEEEEEEEEEE!!! !